A pow-wow is a gathering of North America's Native people, at least that was the original meaning. 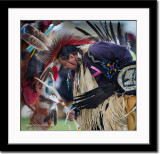 Nowadays, a pow-wow is a specific type of event where both Native American and non-Native American people meet to dance, sing, socialize, and honor American Indian culture. This is the first time that I attended a pow-wow although I have seen images of pow-wows over the years. What an eye-opening experience it was! This particular pow-wow was arranged by the Chumash Indian based in Southern California or around Santa Ynez Mountains to be exact and it took place in Malibu. A lot of tribes from throughout the continent came to this pow-wow and celebrated this multi-tribal event. I stayed for good 6 hours and at the end of the day, I left that place exhausted but I enjoyed the experience very much. I think I am ready for the next pow-wow. Although I did talk briefly to a few dancers but I didn't have the opportunity to exchange any information. If you see yourself in the pictures or know the people here, I would be more than happy to provide you with the images. Please contact me by email for that. I am not using any of the images for commercial purposes and please respect the privacy of these people and do not use any of the images as such. The main reason for me to post the images is because I really enjoy photography and for strictly personal uses. The toughest part is to blur the background to get a nice smooth bokeh for better target isolation. With tents surrounding the fire in the middle, and the dancers circling around the fire, it was seriously difficult. I used a 300mm prime lens and a 70-200mm lens, both at wide open aperture 99% of the time to throw the background out-of-focus as much as possible and I also tried to compose tighter. In addition, the dancers moved at a good speed and I used the continuous AF (AI Servo) mode and just follow their eyes but at time, I could only follow their faces while triggering the shutter. Yes, I also used a portable flash to fill in shadow and the flash was set at -1 on the camera body. Thank you for visiting and please leave a comment on the images or on the gallery as you see fit. Enjoy the images! Definitely a Crowd Pleaser! Bravo! Dear Guest who made the comment.. before dropping the "race" judgement open your eyes and look at the photo. They have princess written on their head gear. I am sure the assumption of the photographer is that they earned a princess award at the powwow.. Any well traveled photographer has long lost ANY prejudice towards a race but cherishes the diversity of human kind.. There are no Indian princesses. Please use respectful terms that native want, NOT your European ideals that are incorrect. Great gallerie with colourful portraits !